Lead singer and founding member Tyber Cranstoun's love for Ska and Reggae music developed from a very early age. His father, Bill was a local promoter of Jamaican music in the 1960s and ran his Savoy Sound System at several locations in south London. After graduating from Guildhall School of Music and Drama, Tyber began busking with his brother Si Cranstoun on the streets of Canterbury and South London where his distinctive vocals and lively performances soon began to draw in large audiences. With an ever increasing fan base developing, Tyber seconded a group of musicians. Together they began writing their own songs and performing them live to audiences across the south-east. 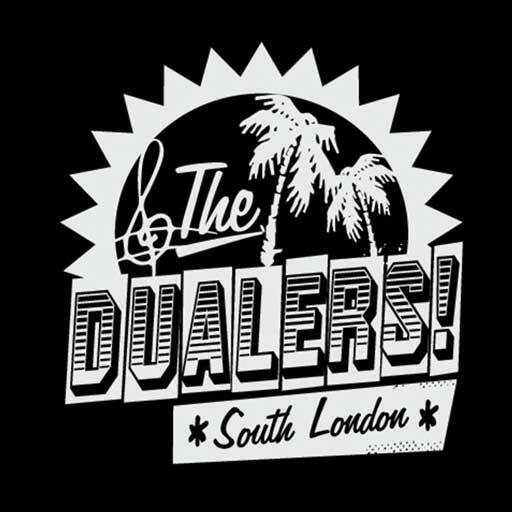 As The Dualers, they progressed to performing alongside some of the biggest names in Ska and Reggae including The Skatalites , Prince Buster , Toots and The Maytals , Ziggy Marley , Jimmy Cliff , UB40 and Madness. They sent shock waves through the music industry when their single Kiss On The Lips entered the UK charts at #21 despite no national airplay or professional backing. Their next release 'Truly Madly Deeply' charted at #23 and featured in the Hollywood blockbuster Fools Gold starring Kate Hudson and Matthew McConaughey. With a number of album releases, several top 40 chart singles, a record breaking 10 sell out shows at the Indigo O2 and a large worldwide fan base behind them, their success has continued. Now heralded as one of Britain’s finest Ska & Reggae bands The Dualers continue to play to sell-out crowds all over the UK, Europe & Asia. The Sun - "Once you start dancing to The Dualers it’s impossible to stop"
Q Magazine - “The Dualers soulful harmonising has admirable echoes of Bob Marley & Sam Cooke"
The Independant - "These local superstars are inching towards fame"